Last week the San Francisco Chronicle published an article - called "GREEN Eyes in the Sky " about how Google Earth is leveling the playing field for environmentalists by providing a powerful visualization tool. First, GE provides them with a powerful way to look at high resolution satellite and aerial photography of pollution, waste, industrial growth, and encroachment to natural areas (see example here). Second, GE is also a powerful presentation tool allowing them to not only see the ground in close detail, but also allowing the presentation of pictures, data (for example, waste sites, oil wells, etc. ), highlighting rivers and waterways, showing deforestation , and more. The SF Chronicle story highlights some examples of environmentalists using Google Earth. 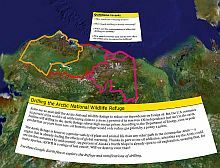 For example, the Sierra Club have put together a GE presentation on the encroachment of the Arctic National Wildlife Refuge in Alaska (here is the web site). Once you download it, make sure you look through the many options in the arctic.kmz folder you will find in your Temporary Places folder to see photos, movies, oil well placemarks, and other information they have provided. Another excellent GE presentation was put together in response to some proposed logging in the Santa Cruz mountains of California. A concerned citizen put together a model showing where the logging would be done and the effects on the watershed. This presentation resulted in the proposed logging plan was withdrawn. Want to draw ice shell cover on planet earth. I have drawn path and picked color and want to know how to fill in the areas drawn. Given the irrefutable evidence of habitat loss, global warming, etc., management of Earth's resources is no longer an option. Therefore, selection of the appropriate (and most pragmatic) methodology is the problem. As the Copenhagen Consensus (http://www.imv.dk/Default.aspx?ID=158) seems to be the best choice in a world with so few real leaders, the only question is how to implement. Obviously, getting around the exclusivity issue that right now pretty much defines the environmentalist movement - mainly upperclass white guys, a smattering of asians here and one or two token blacks there - and getting the message out to the greatest number of people, no matter what their ethnicity, is the only real answer. We have the means via the wordwide computer network that you are tuned into at this very moment; so what's wrong is obviously that there's no entertainment value or sales pitch to push that message in front of those who need most to get it. Not the effete, polite, supersensitive in-crowd: no; it has to be the guy who throws his beer can out the back of his car because, for whatever reason, he's simply not educated. Advertising is a proven workhorse that can deliver the message - judging from the foul straits we're in today, the only real success America has ever really had - so let's drop all this pretense of noble causes and not wanting to get our hands dirty with something so vile as commercialism, when it's the only way we're ever going to climb out of the hole we've dug ourselves. GOOGLE EARTH PLUS IS EXCELLENT, BUT WHAT DOES THE $400 PER MONTH GIVE THE SUBSCRIBER? I NEED THE SERVICE iF CLARITY OF OCEAN FLOOR IS INCLUDED , AND NOT SUPERIMPOSED FROM PREVIOUS IMAGES. I NEED ACCURATE PRESENTATIONS OF MOUNTAIN RANGES IN ADDITION TO ARCS, OCEAN TRENCHES, MID-OCEAN RIDGES FOR MY OIL EXPLORATION "BASIN" ANALYSIS. THANK YOU FOR THIS WONDEROUS TOOL. I PREDICT IT PROVIDE A NEW DIRECTION FOR GEOLOGY ,OIL EXPLORATION AND OTHER MINERAL EXPLORATION ACTIVITIES. Google Earth Plus is only US$20 per year. Google Earth Pro is the more expensive option. All of the GE versions use the same photo database, so you do NOT get higher resolution images in the fee-based versions.